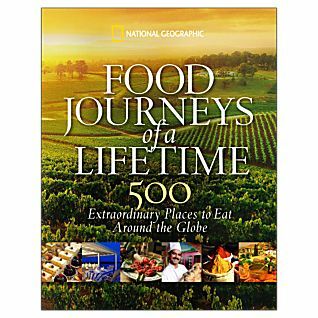 So this Saturday I was at the lovely local library again and picked up National Geographic’s Food Journeys of a Lifetime. Travelers who love to eat (and really, what’s the point of traveling without immersing yourself in the local cuisine?!?!) need to get this book stat. Food Journeys of a Lifetime is a gorgeously photographed book. It covers all of the great foods and food experiences the world has to offer. Chapters are organized by themes such as Street Food, National Dishes and Food Towns. It’s a pretty comprehensive book, covering not only the typical standard fare such as chocolates in Belgium and cheese in France, but also Georgian cuisine and Oktoberfest in Namibia, a former German colony. I pointed out the pages on herring, jenever, and Gouda to hubby, who was happily surprised that his tiny country made it into the book several times. I just love flipping through this book, imagining what it would be like to travel around the world sampling the featured dishes, experiences and restaurants. With each page is handy information on the best time to visit the featured location, where to stay and how to get there. I already have a subscription to National Geographic Traveler which is a great travel magazine for those interested in more off-beat, adventurous and personal travel. I’m considering purchasing this book so that I’ll have it around forever. Hopefully it’ll be full of dog-ears soon, showing all of the food that I’ve experienced. Christmas is just around the corner so consider this gift for the foodie traveler in your life. Great tip! I’ll put it on my wish list.